The Federation of Small Businesses (FSB) has claimed that small Scottish businesses are lagging behind the UK in new technology investment. Over the past year they have invested an average of £2,650 in new technology, compared with a UK-wide figure of £3,500. About half of the Scottish firms cited shortcomings in local digital infrastructure as a barrier to investment. But an analyst has said that the "excuse" of poor local digital infrastructure is only valid for places like the Highlands. 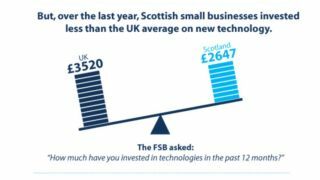 The FSB has highlighted the results from Scotland as part of its recent UK-wide survey with IT industry association Intellect on small businesses' use of technology. The survey, which was carried out in January, received responses from 2,200 businesses across the UK, including 230 from Scotland. Despite this, the FSB says that four in five small Scottish firms believe they can grow their business by investing in technology. Andy Willox, the FSB's Scottish Policy Convenor, said: "Firms recognise that technology can give them an edge but, worryingly, Scottish firms seem less keen to invest than their counterparts elsewhere in the UK. "Better infrastructure, they say, would encourage them to invest and we look forward to the promise of improvements in this area becoming a reality," he added. "Scottish business owners, too, must regularly ensure they're taking advantage of the opportunities which new technology presents." BT recently announced it is aiming to roll out a £146 million fibre optic broadband programme in Scotland's Highlands and Islands. The complaint about infrastructure is contested by Anthony Mullen, senior analyst at Forrester Research, who told TRPro that the 'excuse' of poor local digital infrastructure is only valid for places like the Highlands. "I think the more accurate picture would be to look at investment levels versus business and population density, which would reveal two pictures - urban Scotland and rural Scotland," he said. "Given the density of population in England a fairer comparison would be with urban Scotland." He said the difference in investment is partly due to the lack of variety in businesses, with Scotland's landscape heavy on banking, insurance and public service. "These sectors do of course invest in technology but they have a higher risk profile and therefore cycles of technology adoption are lower," Mullen said. "SMEs on the other hand should invest in technology as a differentiator, and certainly cloud services make these simpler." He added: "Scotland is good with academic and innovation but not around commercialisation and industrialisation of product. Once the mechanics of production and distribution are needed then the geographic positioning of Scotland becomes a problem - for sourcing and supplying physical materials. This means less technology investment in fleet solutions, manufacturing and distribution techniques."